Cold redrafted has been in the making for quite some time, and that shows within the professionalism, the complexity and the adult approach. In general, the album continues where Infinite Dissonance came to an end, but it goes a few steps further, exploring new dimensions. Striking are the many clean voices (and some spoken words) on this second album, acting like a counterbalance to the raw and screaming grunts. It’s one of the things that shows the modern evolution of this band. Also composition-wise there is a new angle going on. 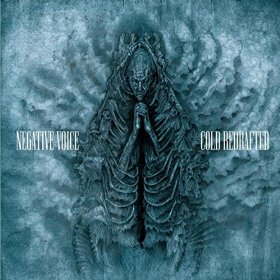 Negative Voice still perform Dark / Doom Metal, but this time there are quite some elements from Progressive Rock / Metal too. This (unique) combination will surely be adored by fans of the new school trend. But old style followers do not need to fear, for there’s plenty of stuff going on from the scene from two-three decades ago. Don’t forget that acts like Opeth were experimenting with progressive elements too, at that time when they were still monumentally heavy and blackened. About all pieces have something to show, but a couple of them exceed above the others. Instant, for instance, is to my opinion the most outstanding composition, because of the weird and little dissonant guitars, the fantastic and ultra-dark intermezzo at about two minutes (followed by that melancholic twin solo), etc. And what to think about a piece like Lighthouse, which includes Seventies / Southern Rock elements, and even some Blues / Stoner hints. And you know, there is a certain catchiness going on throughout Cold Redrafted, referring to a specific pop culture, but this without betraying its roots, and without losing itself into pathetic and empty-brained easy-listening Music.